Let's face it, valve covers love to leak. I personally have one that needs attending to this winter. Thankfully, it's not too complex of a job on the MK5 GTI or any other car with the VW BPY engine. Whether you have an oil leak from your valve cover gasket or a vacuum leak from your PCV system, that valve cover is going to need to come off. Thankfully, Charles (HumbleMechanic) Sanville, explains how to get to - and remove your valve cover in just a few easy steps. Since you might be working on a car other than the MK5 GTI that has the BPY motor, this step is different for everyone. Just make sure you have clear access to the top of your motor. Once you get this off, it helps to have a clean engine bay to work in. Clean up any debris using compressed air or a vacuum. Gently use a flat pry bar or flat head screwdriver to lift the coil packs out of their wells. Once you have all four lifted out, you will see that they all move easily along with the loom they're connected to. This next part requires a delicate touch. To remove the coil packs from the loom, push the connector toward the coil pack while depressing the tab. You can then gently slide the connector away from the coil pack without trying to disconnect it completely. Doing this for all four coil packs allows you to easily move the entire loom out of the way easily. There are a few hoses and lines that perform various functions of the PCV system. In order of the images below, we start with the hose to the PCV Valve. Squeeze the fitting/clip at twelve and six and pull it out. You can then rotate the hose out of the way without undoing the other end. Next up is the primary oil separator hose located just behind the PCV hose we removed. This one is held in place by four (brittle) tabs, so try to be as gentle as possible. Sometimes these require a little persuasion with a flat head screwdriver. Here you can see that Charles encountered already broken clips so this will have to be replaced. As well as broken tabs, you can see the o-ring is pretty chewed up, so a replacement is needed. Even the slightest of leaks will affect the operation of your vehicle. The last PCV system hose to remove is located between the oil filler cap and the PCV valve. This one is simple and only has two small clips holding it in place. Squeeze at twelve and six like the first hose, and you should be able to remove it easily. This hose has two o-rings on it as well; you should inspect them for defects while you're here. There are two T30 Torx screws that hold the timing cover to the valve cover. Remove these and be careful not to drop them into the engine bay. They might take a tiny bit of effort to remove since these screws call for blue threadlocker. There are fourteen T30 Torx screws to remove on the top of the valve cover. These screws are captive in the cover (meaning you don't need to back them all the way out to remove the valve cover). You can still remove them entirely, so be careful as not to drop them into your cylinder head. Standard procedure is to loosen from outside to in. There are two hoses at the back of the valve cover that need to be pulled away to get the cover off. Depending on what type of hose clamps were used, use either hose clamp pliers or needle nose pliers to remove them. 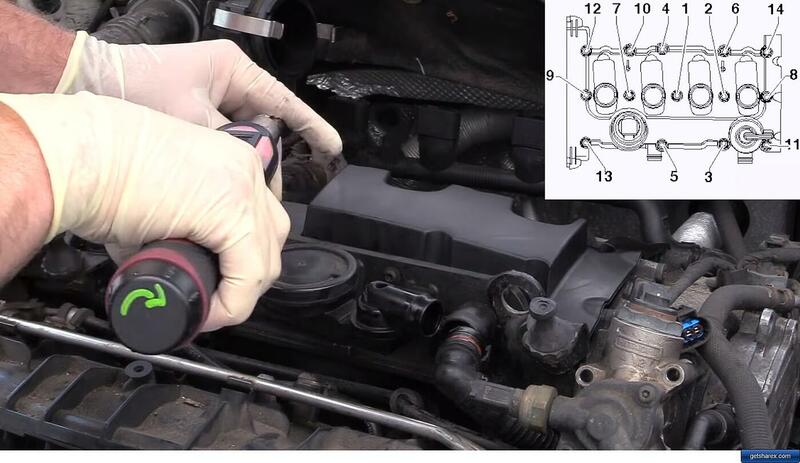 Use a small pick to gently break the hoses free from the valve cover. Now you should be able to gently pry the valve cover up using a flat head screwdriver and pull it up and toward you. Now that your valve cover is off, removing the PCV Valve is easy. Four T25 Torx screws hold it in place, unscrew those and it should come off easily. Use your pick to remove the old gasket and replace with your new gasket. You made it! You can now pull the old valve cover gasket out of it's channel, or just toss the entire valve cover if you're replacing the entire unit. Make sure the channel is clean of any debris and insert the new gasket just as the old one came out. It only fits in one way and is pretty self explanatory. Now is a good time to replace your oil filler cap as well. These have a gasket that deteriorates. Using brake clean and a lint free rag, clean all the mating surfaces of oil and debris. It seems simple but is an important step to ensure you remain leak-free in the future. No surprises here; you're just going through the steps in reverse. The most important part of reassembly is proper torquing of all the screws and the order in which you torque them. Failure to follow the order will result in leaks from the valve cover gasket. The image below shows the correct order. Torque specs are as follows - PCV Valve Screws: 4Nm - Valve Cover Screws: 10Nm - Timing Cover Screws: 10Nm. Now that everything is back together, celebrate saving hundreds of dollars in labor. 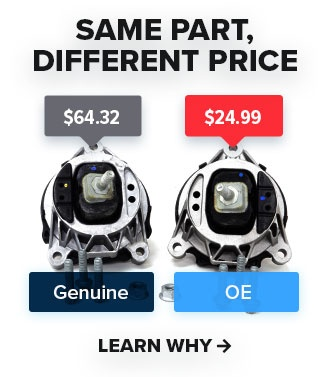 To top it off, you now have the FCP Euro Lifetime Replacement Guarantee on all those parts you just installed. Be sure to check the video below on HumbleMechanic's YouTube page below for the full tutorial, and don't forget to subscribe to get all new videos pushed right to your inbox.